March sales data for the Front Range continues to show strength in the local real estate market. Supply of homes continues to decrease. The number of “actives” on the market is down 35% from this time last year, and even down over last month. Demand is also up over last year (and last month) as indicated by the increase in the percentage sold and under contract. The number of “pending” sales is down. In Metrolist (the Denver-area MLS, and source for this data), the “Pending” category is usually reserved to indicate a sales contract that has been accepted, but is awaiting signatures or requires third party approval. “Pending” might indicate a verbal agreement, but not signature on a bank-owned property. “Pending” would also indicate a property that is awaiting a lender’s approval for a short sale. 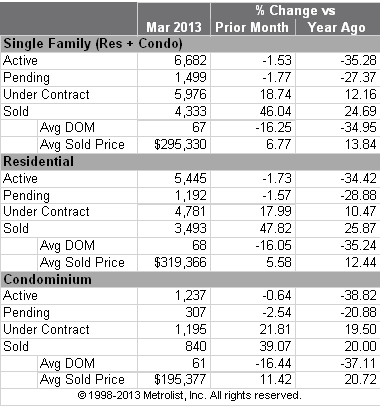 The percentage of Pending properties has decreased since February, and since this time last year. This could be an indication that there are fewer distressed sales since this time last year (fewer lender-owned and shortsales). Days on Market (DOM) is down. Days on Market is the number of days between the listing date and the date the listing goes under contract. On average, homes are selling nearly 35% faster than this time last year. Sold prices continue to climb. For all Single Family homes, the average sold price is up nearly 14% over last year. BUYERS: If you are thinking of buying, don’t wait too long. Prices are rising, and have been rising nearly every month for the last year. Be prepared to act when you see a house that will work for you. There is a lot of competition for homes in this market (there are fewer of them, and what is there gets snatched up quickly) so be prepared by being pre-approved for a loan before you go out looking. Being pre-approved will make your offer appear stronger to a seller, and will increase your chances of getting the home. SELLERS: If you are selling, be prepared for a relatively quick offer. Overall, the stats indicate that you should be under contract within 60 days or so. However, depending on the price range you are in, it could be much faster than that. Once under contract, expect to close the sale within 30-45 days. If you have any questions about the market and how it will affect your home buying/selling experience, feel free to contact me with any questions, using the form below. * This information is based on information from Metrolist, Inc. for the period (03/01/13) through (03/31/13). Note: This representation is based in whole or in part on content supplied by Metrolist, Inc. Metrolist, Inc. does not guarantee nor is in any way responsible for its accuracy. Content maintained by Metrolist, Inc. may not reflect all real estate activity in the market. This entry was posted in For Buyers, For Sellers & Homeowners, Real Estate Market & Stats and tagged denver real estate, for sale, home, home values, house, market activity, real estate market, real estate statistics, sale, sales stat, selling, selling home, westminster on April 10, 2013 by joanbagwell.